PLEASE NOTE: This show has sold out! But fear not – we’ll be announcing a follow-up show in the spring shortly! Join our mailing list at the top of the page for updates. We’re delighted to be presenting ‘an evening with’ Honeyfeet – at St Michael’s in Ancoats! Join Honeyfeet as they celebrate the release of their single Sinner on Wah Wah 45s! For a good few years, Honeyfeet has been a conduit for the ideas and expressions of an exotic mixture of Manchester-based musicians. Jazz? Yes, some of that! Folk? Stick that in there! Hip-hop? I thought you’d never ask! 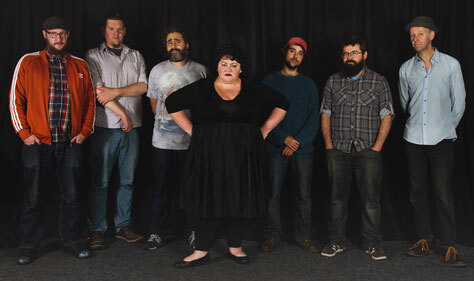 Honeyfeet released the album It’s a Good Job I Love You in November 2013. Their new single Sinner was released in October 2017 on Wah Wah 45s. Their new album, Orange Whip, will be launched in March 2018. This show will be ‘an evening with’ Honeyfeet – featuring two sets by the band, of songs old and new.